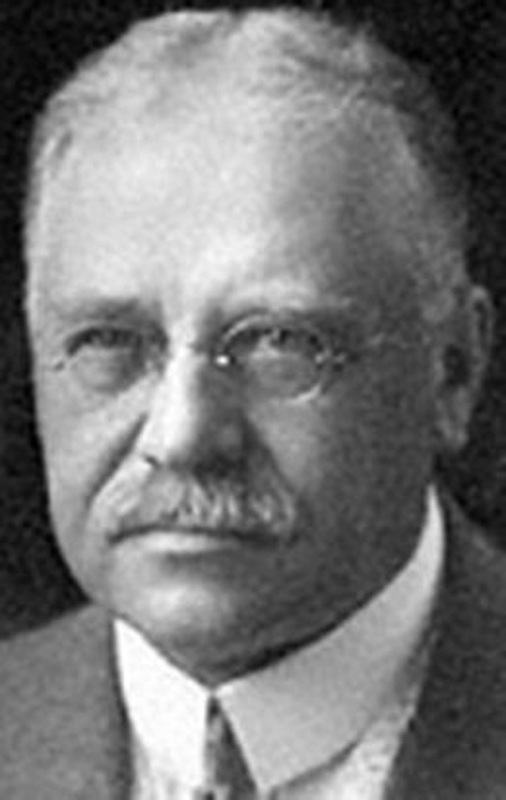 Kessler Boulevard was indeed named for a prominent man in Indianapolis history. George Edward Kessler was a highly respected city planner, landscape architect, and parks consultant. 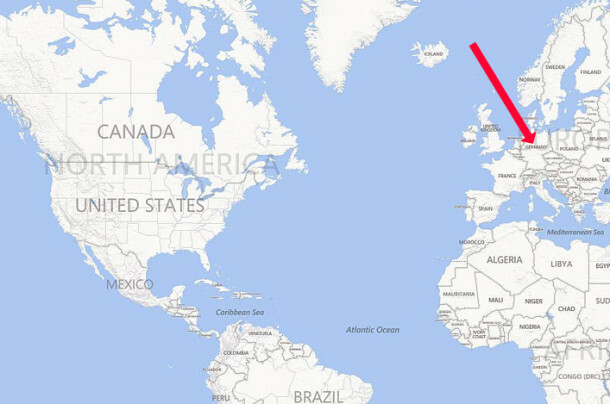 Kessler’s plans can be found in 23 of the United States, as well as in Mexico and China. Kessler’s body of work included 230 known projects, one of which was the landscape design for the 1904 World’s Fair in St. Louis. As most of his papers were destroyed or given to clients after his death, there may actually have been more. 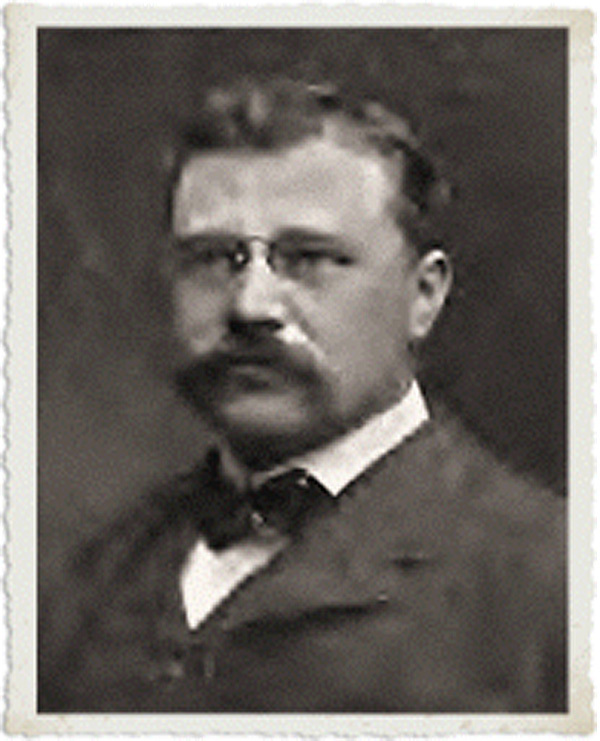 George Kessler was born on July 16, 1862, in Bad Frankenhausen, Schwarzburger, Rudolstadt, Germany. He came to the United States with his parents, Edward Karl Kessler and Clotilde Zeitsche Kessler, when he was two years old. He attended public schools in New York, New Jersey, Wisconsin, and Texas. The Kesslers were enumerated on the 1870 Census in Jersey City, New Jersey. In the years that followed, they planned to make their permanent home in Dallas, Texas. George’s father, already financially secure, had invested in a cotton plantation that would likely have made him an even wealthier man than he already was. However, Edward Kessler died suddenly in 1878, at the age of 46. Concerned about his future, George’s widowed mother left Texas and took the family back to Germany, where she was more familiar with the educational opportunities for her teenage son. There George received both private instruction and university courses for about three years. He studied forestry, botany, landscape design, engineering, and civic planning. Following his training in Germany, George Kessler returned to New York City. 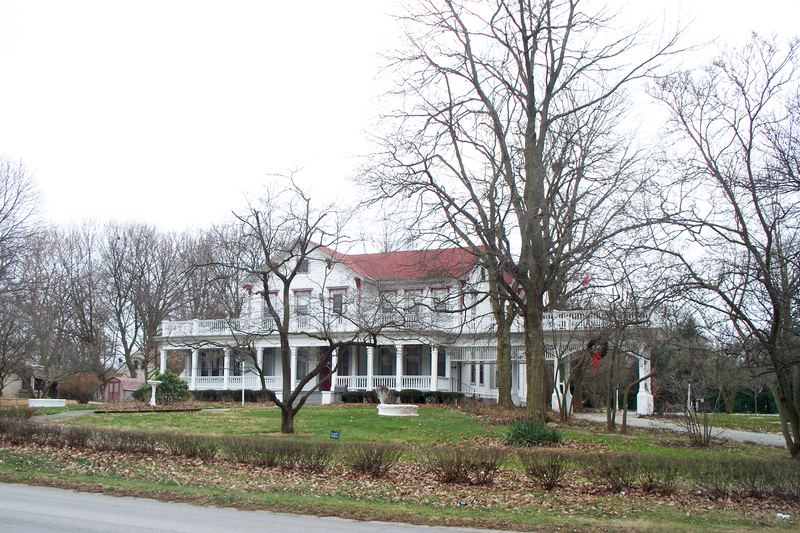 He soon landed an assignment with the prestigious firm of landscape architect Frederick Law Olmsted. In 1892, Olmsted sent Kessler to lay out a park in Merriam, Kansas, southwest of Kansas City. After two additional projects in the Kansas City area, Kessler began to receive national recognition. By the end of the nineteenth century, he was in great demand for his support of the City Beautiful movement, which promoted efforts to relieve the overcrowding and pollution that plagued many cities. The basic concept was that both the aesthetics and the air quality could be improved by interspersing parks and boulevards throughout an urban setting. 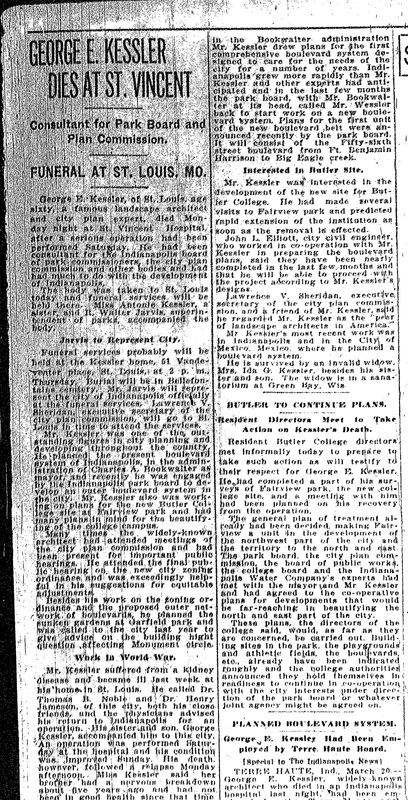 In 1908, the City of Indianapolis hired George Kessler to help it improve its fledgling park system. The Board of Parks Commissioners had been created in 1895, during the mayoral adminstration of Thomas Taggart and was continued under the two adminstrations of Charles A. Bookwalter (1901-1903 and 1906-1910). Kessler spent a year studying the city’s transportation system, waterways, and existing parks. 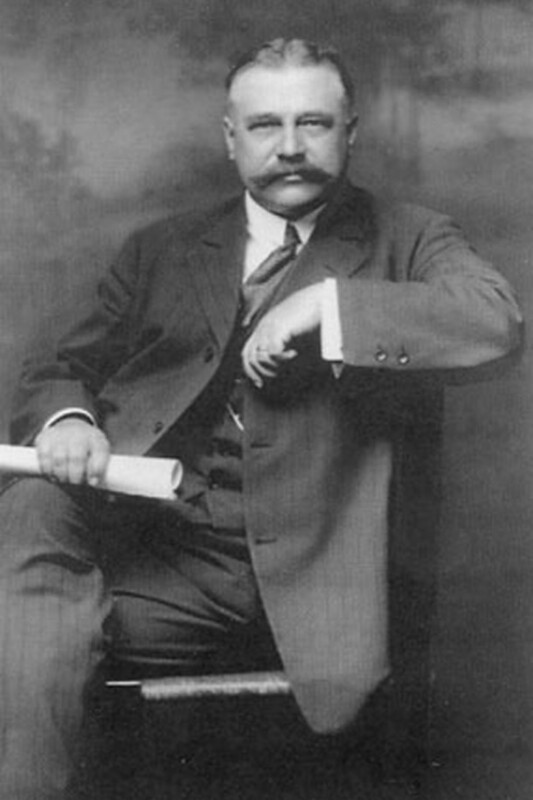 In 1909, he submitted his Indianapolis Park and Boulevard Plan (commonly referred to as “The Kessler Plan”). 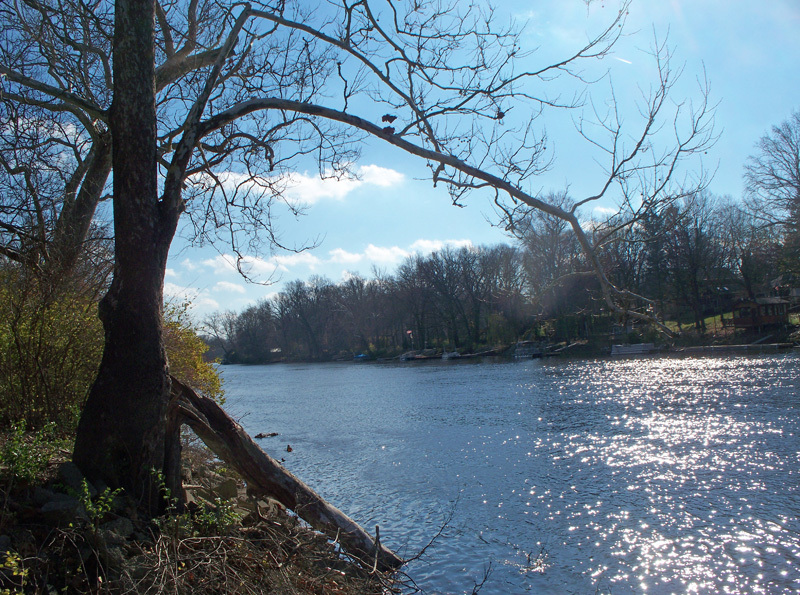 Kessler made six waterways the cornerstones of his parks plan — White River, Central Canal, Fall Creek, Pogue’s Run, Pleasant Run, and Eagle Creek. 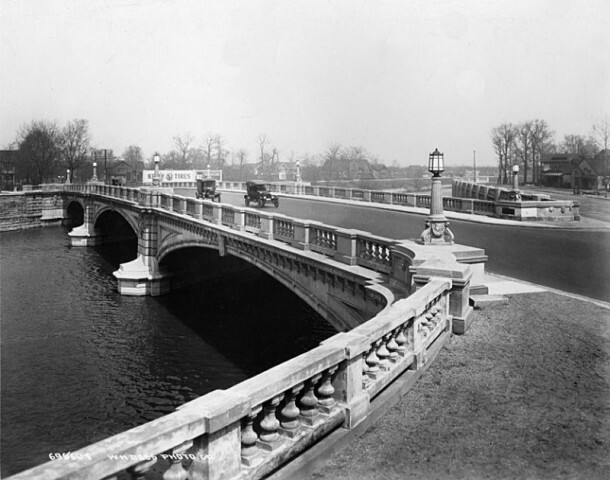 He proposed landscaped boulevards and attractive bridges linking the parks together. Twelve city parks were part of the original plan, including Garfield Park, Brookside Park, Riverside Park, Willard Park, Fletcher Park, Highland Park, Indianola Place, MaCarty Triangle Place, Noble Place, Military Park, and University Park. Other smaller parks eventually were included by their proximity to the larger parks. The City adopted Kessler’s plan in 1909. He led the Park Commission for the next several years, while the plan was being implemented. 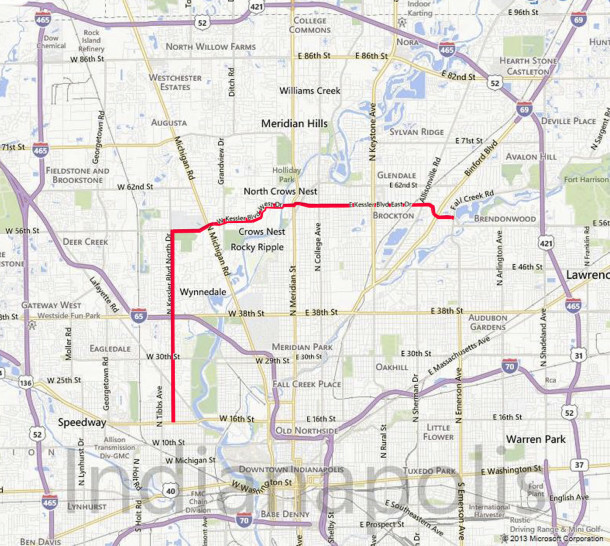 In 2003, the Indianapolis Park and Boulevard system created by George Kessler was placed on the National Register of Historic Places. In 1920, the City of Indianapolis hired Kessler to design a new project, a major road that could move traffic quickly from one side of town to the other. 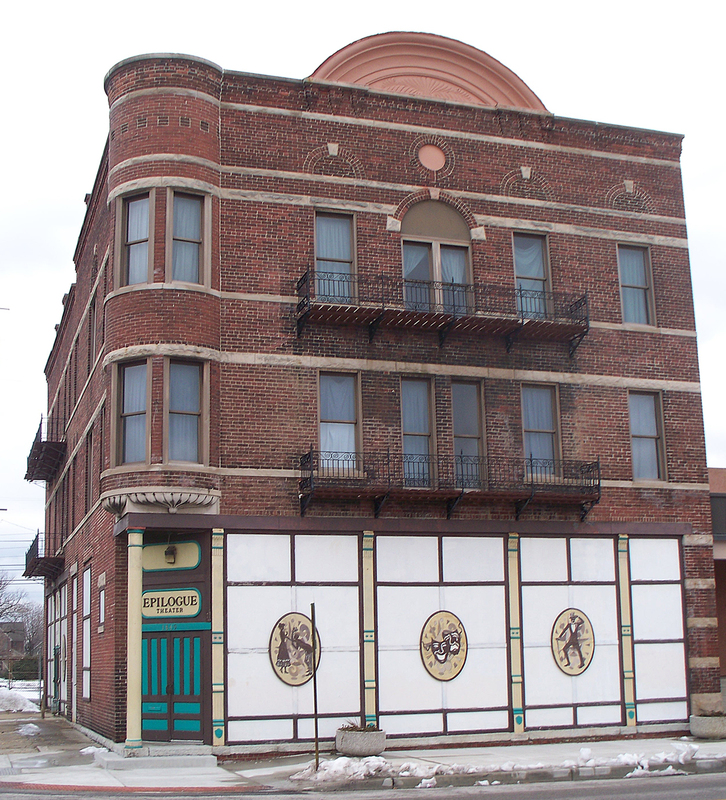 Sadly, Kessler died in Indianapolis on March 20, 1923, before the project was finished. His body was returned to St. Louis, where he, wife Ida, and son George Jr. were residing at that time. Kessler was buried in Bellefontaine Cemetery in St. Louis. 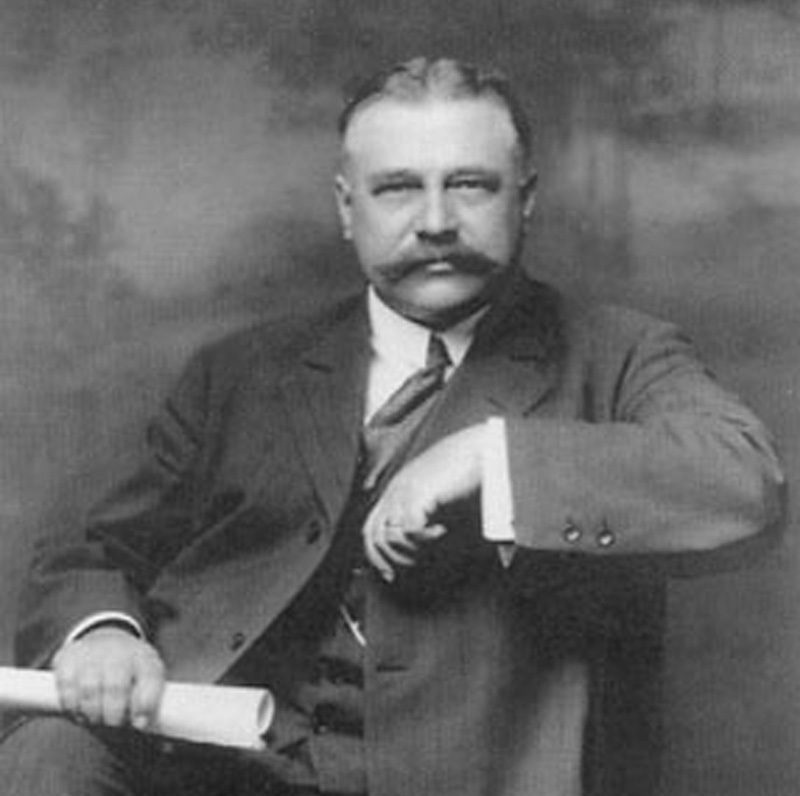 The Indianapolis road project on which he had been working at the time of his death, a 1920s version of the modern-day beltway, was named Kessler Boulevard in his honor. Other cities around the country in which he had completed projects also named local landmarks after Kessler, as well. There are three “legs” to Kessler Boulevard — North Drive, West Drive, and East Drive. Kessler Boulevard North Drive is about three miles west of Meridian Street. It originates at West 16th Street (1600 N) on the south end and extends north for about four miles to West 56th Street (5600 N). Prior to its being named Kessler Boulevard, the section of the road that already existed was known as Cooper Avenue. Today, the street that continues on north of Kessler Boulevard North Drive is known as Cooper Road. Kessler Boulevard West Drive extends from Cooper Road/Kessler Boulevard North Drive (3000 W) on the west end to North Meridian Street (00) on the east end. The portion of it that already existed prior to being named Kessler was originally known as West 56th Street. Kessler Boulevard East Drive extends from Meridian Street (00) on the west end to Emerson Way (5000 E) on the east end. 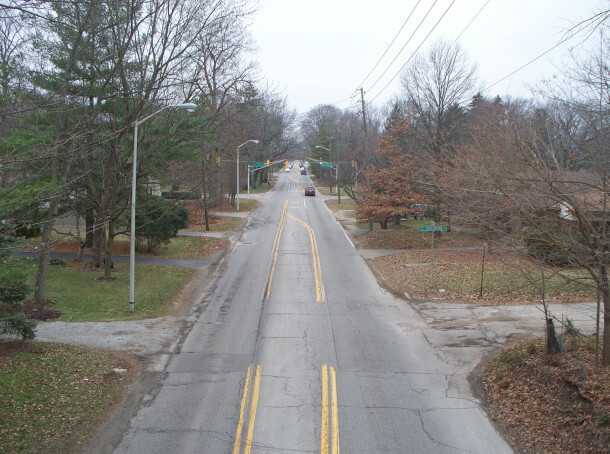 When Broad Ripple was a separate town, what is now Kessler Boulevard was known as East 58th Street. After the annexation of Broad Ripple to the City of Indianapolis in 1922, Broad Ripple street names and numbers were revised to conform with Indianapolis street names and numbers. East 58th Street then became East 59th Street for nearly two decades. In 1941, East 59th Street was renamed Kessler Boulevard East Drive. Regarding the second part of your question — the naming of Indianapolis streets for prominent or noteworthy women — I am not aware of a single one! Although there are a number of street names that appear to be female (Annette, Babette, Bertha, Beulah, Beverly, Charlotte, Daphne, Doris, Emily, Ida, Janet, Loretta, Marsha, Melissa Ann, Naomi, Olivia, Patricia, Paula, Shirley, Tina, Victoria, and so on), I think these streets were probably named for the wives and daughters of early landowners or for the wives and daughters of the developers who built the neighborhoods in which they are located. That’s not to say that these weren’t all great women, but just that their accomplishments probably weren’t widely known. I can certainly think of many women who might deserve such an honor. They include May Aufderheide Kaufman, Betty Barteau, Eliza Ann Blaker, Avriel Christie Shull, Joyce DeWitt, Kathleen Ellis Landgraf Greer, Janet Flanner, Hank Landman Phillippi Ryan, Jacqueline Means, Mary E. Nicholson, Jane Pauley Trudeau, Julia Porter Carson, Madelyn Pugh Martin Davis, Mary Ritter Beard, Caroline Scott Harrison, Mary Tomlinson Krebs (aka Marjorie Main), Fanny Van de Grift Stevenson, Madam C. J. Walker, May Wright Sewell, and more. Though not a street, the municipal golf course on the southside is named for Sarah Shank, Indianapolis Mayor Lew Shank’s wife. Thank you for pointing that out. Although it’s not a city street, at least there is a public venue in Indianapolis that’s named for a woman. Samuel Lewis “Lew” Shank married Sarah Ellen Robbins on June 16, 1906. She died in 1924, while Shank was serving his second term as Mayor of Indianapolis. I imagine there was a great deal of sympathetic public sentiment at the time to honor her in some way. Kessler also designed the brick fence that surrounds much of Crown Hill. Thank you for providing that detail. I read in some of George Kessler’s online biographies that he had done work for Crown Hill Cemetery, but none of the sources elaborated on exactly what the project was. That George Kessler designed the brick wall and wrought iron fence around Crown Hill make perfect sense, as Maple Road was one of the many boulevards Kessler designed to connect the waterways of Indianapolis (in this case, linking the White River on the west with Fall Creek on the east). Unfortunately, as a result of the widening of the street, the rows of beautiful maple trees that were the inspiration for the name Maple Road are now gone. I can still remember how Maple Road/West 38th Street looked when I was a child. I came across this post today and expected to read a mention of the street I grew up on in Indy, Bolton Ave., I thought it was named for Sarah Bolton, the poetess. ‘Paddle Your Own Canoe’ was a poem we learned in grade school, back in the day….